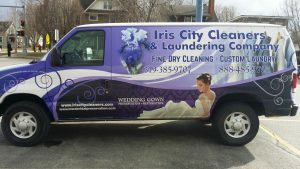 Iris City Cleaners can supply simple or elegant tents for your next reunion, company event, graduation or outdoor wedding. Tents add a beautiful focal point for your event, while providing shade or protection from wind and rain. So, if you're having a party, we specialize in linen rental and can seat over 4000 persons with our current linen inventory. We provide tables, round and banquet size, chairs to match along with linens of your color choice plus napkins. Table skirts, of course, and if your occasion is out doors we have tents available of the size to fit your needs. 30 days advance notice on large party setup reservations. We supply this banquet setup service and tents locally and at a radius of 200 miles of Mt. Pleasant where minimums apply. Call us for your banquet setup, linen, and tent needs. Please call us at 319-385-9707. Our Fax number is 319 385 9707. A customer service representative is available to to serve you Monday through Friday, 8:00 A.M. - 5:30 P.M. and Saturday, 9:00 A.M. to 12:00 P.M., Central Time. Any phone calls after business hours will be transferred to our voice mail system. Please phone us to place your order. We recommend that you place your order three to six months prior to your event date to ensure availability. However, please do not hesitate to call us with less lead-time and we will make every effort to accommodate your order. A non-refundable deposit of $75.00 is required to reserve chair covers and linens for your event. The $75.00 deposit is applied to the rental cost of your order. The deposit and final payment may be paid with a major credit card or you may send us a check or money order if paid three weeks prior to event. Please note sales tax will be charged on Iowa orders only. Please be aware that once we reserve an order, other orders may be turned away to honor our commitment to you. In the event you need to cancel an order, your deposit of $75.00 will be forfeited. If cancellation is necessary 35 days or less prior to your event date, a restocking fee of 25% of your total order will also be charged in addition to forfeiture of the $75.00 deposit. Any additions of items made less than two weeks prior to your event are subject to an additional 25% fee on the charges for those items. 1. Whether the chair is a folding or banquet style chair. 2. Measurement from the top of the back of the chair to the floor. 3. Measurement of the width of chair back at the widest point. Our standard chair cover fits most banquet-style chairs. We also have large, extra large and folding chair cover sizes that will accommodate most any other chair. We will issue a call tag with the shipper to have the rental items picked up on the Monday following your event. You are responsible for boxing up your order for return shipment. You may use the boxes that your order arrived in if they are in good condition. Otherwise, you are responsible for supplying boxes to return your order in. Please note that if you make arrangements with your banquet hall or facility to box up your order, you are still responsible for late return charges if it is not ready for pick-up on the Monday following your event. Please check with your banquet hall or facility to ensure that your order is boxed and ready for return on time. Please note that pick-up times vary with shipper and location. Therefore, your order must be packed up and ready for shipment PRIOR to Monday. Please have all items boxed and taped with the boxes labeled with our name and address prior to Monday. 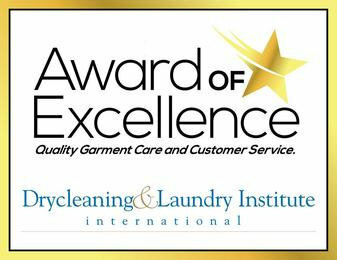 There is no need to fold or launder items after your event. However, all linen must be dry and free of food and debris prior to boxing. Any linen packaged damp is subject to mildew which could incur replacement costs. Please have rental items ready for pick up on the Monday following your event unless alternate arrangements have been agreed to in writing. A late return fee equal to 10% of your total order cost will be charged for each day past Monday that your order is not returned to us. After 7 days, the late fee will be equal to your total order cost. Please have the rented items back to our warehouse on the Monday following your event. A late return fee equal to 10% of your total order cost will be charged for each day past Monday that your order is not returned to us. After 7 days, the late fee will be equal to your total order cost. All linen and chair covers must be returned in the same quantity and condition that you receive them in (i.e., no rips, holes, or wax stains). Full replacement cost will apply to any item that is rendered unusable or missing upon return of your order. Loss or damage replacements cost on chair covers is five times the rental price. Loss or damage on all other items is two and one half times the rental cost. We ship chair covers and linens anywhere in the continental United States. Shipping fees are in addition to rental fees and are added to your order. Shipping costs are assessed by weight and typically run $15.00 to $20.00 per 100 chair covers. Most customers have their orders shipped directly to the banquet hall or facility where the event will take place. 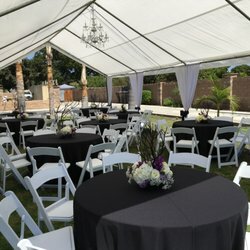 Many customers also make arrangements with the banquet hall or facility to have the linens installed before the event and removed after the event. Your order will arrive at least one to two days prior to your event date. All chair covers and linens are cleaned and pressed prior to shipping and are packed tightly to avoid wrinkles. Orders are tracked to verify there are no complications with shipment after it has left our warehouse. Every effort is made to fill your order accurately. However, you are responsible for counting your order upon receipt and notifying us within 24 hour of any discrepancies.